In the previous version of SharePoint—SharePoint Server 2010—the Web Analytics Service Application maintained usage and analytics data for the SharePoint farm. With the new SharePoint 2013 platform, Microsoft redesigned the analytics components and integrated analytics with SharePoint search. Note SharePoint 2013 replaces the Web Analytics Service Application of SharePoint 2010 with the new analytics engine that is part of search. Click the Monitoring heading link. Review the links under the Health Analyzer heading. Because the job of the Health Analyzer and reporting issues is important, you may notice that the Health Analyzer displays a banner on the Central Administration home page when it detects errors or warnings. If you do not see this banner on your Central Administration home page then all is good with your farm. Do not be alarmed if you just installed SharePoint 2013 and now see a red or yellow banner (see Figure 6). The Health Analyzer has a number of extensive rules, which it uses to report anything that might pertain to a configuration, security, or operational issue. Sometimes, these rules trigger to warn users, but the issue is not always serious—such as the rule that warns users of the potential to run out of disk space, which occurs if the amount of memory in the system is more than half the available disk space on the system drive (for core dump purposes). This being said, you should pay attention to every warning and error, just in case SharePoint reports a serious issue. Note You should pay close attention to every warning and error reported by the Health Analyzer. Click the View these issues link, which navigates you to the same page as the Review problems and solutions link under the Monitoring heading. If the Health Analyzer has picked up issues to address in your farm, the Review Problems and Solutions page should list those issues. See Figure 7 for an example from my development farm. Click any of the issues, and SharePoint will open a page with more specifics about the issue. In some cases, SharePoint can help you fix issues, with the Repair Automatically icon on the dialog ribbon. If SharePoint cannot automatically fix an issue, fix the issue manually and then come back to the issue and click the Reanalyze Now icon to request that the Health Analyzer determine if you remedied the issue. 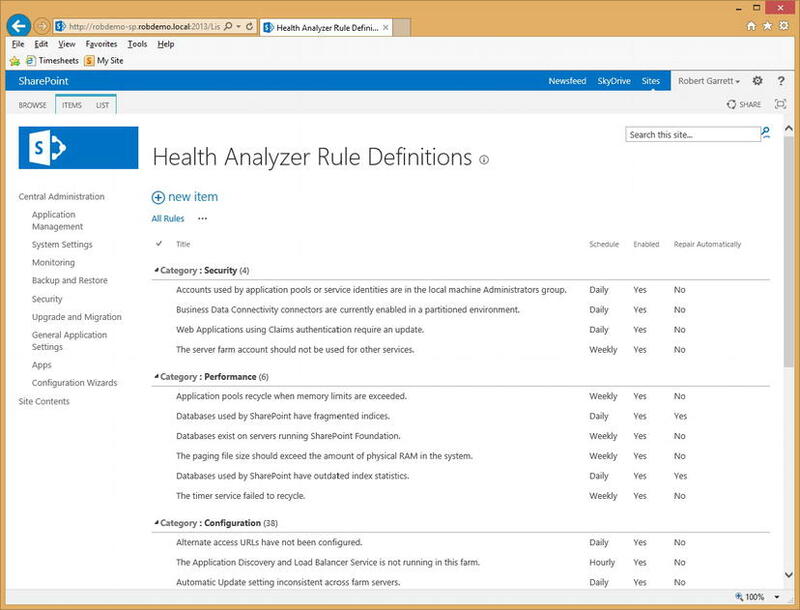 The Health Analyzer uses a series of rules to determine if a particular area of the SharePoint platform needs attention. Navigate back to the Monitoring page in Central Administration. Click the Review Rule Definitions link. 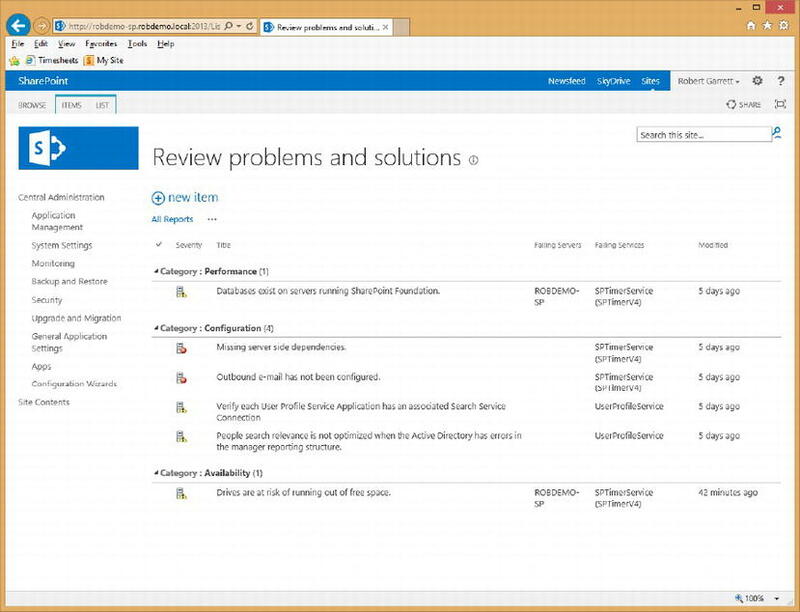 SharePoint shows a page consisting of a standard list of rules (Figure 8). Click the name of any list item in the appropriate category to view the rule definition. You may click the Edit icon to edit the rule list item—you may change the name, scope, schedule, and whether SharePoint can configure the issue automatically.